Ensuring your bicycle is right for you is key to having the most magical two-wheeled adventures. Whether you’ve got a brand new bike or one that you’ve been using for a long time, you might find that there are ways to upgrade your cycle. With this in mind, we at The Insurance Emporium decided to look into some of the best bicycle modifications around. Gone are the days of getting a pinch flat! Many cyclists are ditching their inner tubes and switching to tubeless tyres and wheelsets to avoid this issue, particularly in the mountain biking community. In fact, tubeless tyres tend to be more resistant to punctures as a whole. There are also claims that they can improve speed, comfort and grip. Did you know that Bradley Wiggins and Chris Froome both won the Tour de France using oval chainrings? This alternative shape to the traditional round ring has been turning heads, as well as wheels, because it’s claimed to smooth out pedalling. Theoretically, you won’t have to push as hard at the top of your pedal stroke. However, critics also say that it could cause your chain to drop more easily. The discomfort of a bicycle saddle is somewhat of a long-running joke. However, it doesn’t have to be this way! No two riders are the same, so different cyclists will benefit from using different saddles. Riding position, body shape and cycling discipline are just some of the factors that can affect the type of saddle you will be most comfortable with and that allow the right amount of movement. Nevertheless, it still might be worth wearing decent cycling shorts! You might find that changing up your brakes could improve your riding experience. 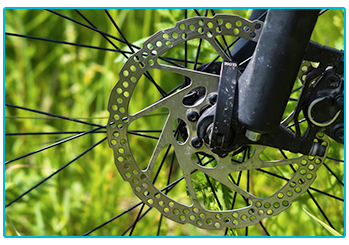 Disc brakes are a very popular option right now, especially on the mountain biking and cyclocross scenes, because of their increased stopping power and how much better they handle in rain and mud. However, if you’re a road cyclist with a need for speed then you might prefer aero caliper brakes. 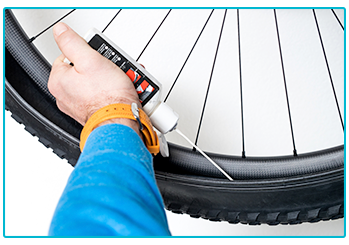 Changing the very thing that you power your bicycle with can have a dramatic impact on your riding experience. Many riders swear by clipless pedals – which, confusingly, you clip into with cycle-specific shoes – because they improve your pedal power and efficiency. However, others lean towards flat pedals because they allow you to move more freely and you can wear any shoes with them. While they aren’t as secure as clipless, some flats do still have decent grip. This type of attachment could be advantageous if you use your bike for commuting, shopping or bikepacking adventures. A pannier rack makes transporting your belongings by bike a lot easier because it allows for a decent volume of things to be loaded onto your cycle. 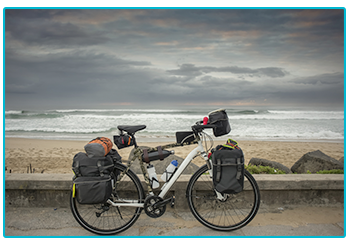 There are various types of panniers you can choose for the front or rear of your bicycle, just check which ones are compatible with it. For mountain bikers, a dropper post can be a valuable modification to add to your bicycle. It allows you to raise or lower your seat while on the go, just by pressing a button. When you’re cycling uphill, having your seat post fully extended can make things much easier. Then, being able to lower your seat when you’re going downhill could help you maintain control on fast descents. There are many useful ways to upgrade your bike and elevate your cycling adventures. Of course, it’s more proof that biking can be costly! For peace of mind over the financial side of cycling, you could get insurance for your bicycle. The Insurance Emporium’s cycle insurance includes cover for Theft, Accidental Loss Or Damage as standard and you could choose Elective Benefits such as New For Old, Territorial Coverage and Competitive Use. You could also get up to 25%* off on new policies. Stop by The Insurance Emporium today to find out more! *The 25% discount is available on lunar and calendar monthly policies and policies where the premium is paid annually. It is made up of 15% Introductory Discount plus 5% Age Related Discount and 5% Security Discount (if appropriate). The Introductory Discount is available for the first 12 premium payments on lunar and calendar monthly policies or one premium payment on annual policies.